The Legislative Reapportionment Commission held a second set of public hearings to allow concerned citizens, like myself, an opportunity to provide the commission with feedback on the preliminary maps released on October 31. The released proposal apparently continued in the poor habits used in creating previous maps. It was not surprising that in light of this, the results often deviated from constitutional requirements. Below are my remarks offered that day that highlighted my full testimony (in the 2nd Holt Legislative Proposal PDF). It proves that even using the smaller variant they used (the courts allow up to 10% and they used 3% and 6%), it is still possible to meet all constitutional requirements. When the video is made available, I will post it here. Update 12/2: Here is the video. Enjoy! 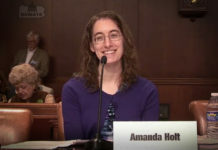 The modified Holt Proposal actually addressed the concerns of many others who also testified. This is because most testimony focused on the detrimental effects of splitting political subdivisions. Thank you for the opportunity to testify today and for the time and efforts you are investing in this redistricting process. In looking at the proposed maps and listening to their presentation on Oct. 31, it appeared and sounded like they were created with the primary goal of protecting as many incumbents as possible (regardless of party affiliation) unless population changes made this impossible and forced a district move. Fortunately, appearances can be deceiving. So I examined each preliminary plan to see if there was a constitutionally justifiable cause for the proposed district boundaries. The PA Constitution gives one underlying rule (that no political subdivision be divided in forming a district) with three possible exceptions to that rule – equal population, compactness, and contiguousness. In addition, there are the requirements of the Voting Rights Act to follow. The preliminary Senate plan contains 39 districts that include county splits instead of the 21 in the proposal before you. It divides double the number of municipalities and splits 27 wards instead of 4. Is the higher number of divisions in the preliminary Senate plan justifiable on constitutional grounds? Looking at Page 3 of your packet: It is not justified on the grounds of equal population, because both plans have basically the same overall variant. Page 9-10: It is not justified on the grounds of compactness, because several districts in the preliminary plan are fragmented or sprawling. Page 11: It is not justified on the grounds of the Voting Rights Act, because both plans have the same number of minority-majority districts with the same minority statistics. The preliminary House plan contains 64 districts that include county splits instead of 37. It divides 110 municipalities instead of 27 and 133 wards instead of 37. Is the higher number of divisions in the preliminary House plan justifiable on constitutional grounds? Looking at page 4 of your packet: It is not justified on the grounds of equal population, because both plans have basically the same overall variant. Page 13: It is not justified on the grounds of compactness, because several districts in the preliminary plan are fragmented or sprawling. Page 14: It is not justified on the grounds of contiguousness, because four districts in the preliminary plan appear to contain portions that are not connected with the rest of the district. Page 15-17: It is not justified on the grounds of the Voting Rights Act, because the preliminary plan dilutes minorities by failing to make them the percentage of a district’s population required by law. The proposed solution before you fulfills each constitutional requirement and abides by the Voting Rights Act while still respecting political subdivision boundaries. Following these Constitutional rules resulted in a few additional or alternate district moves. Looking at Page 12 of your packet: Not one but two Senate districts move from western portion of the state. One went to the Adams/York County area. The other went to the Luzerne/Monroe County area. Also one district from Philadelphia shifted to Chester County. While four House districts made significant moves, only one came from Allegheny County. The fourth district move came from Beaver County. Lehigh County’s population did not require a new district be moved into the county (portions of 7 districts already cover the county and the population only requires 6). Instead, meeting Constitutional requirements gave the district to the eastern side of Berks County. There were also 3 additional districts that moved to neighboring counties. Lastly, page 12 and 17-20 show some alternate ways to draw a few districts while still meeting constitutional requirements. It is this Commission’s sworn duty to uphold the PA Constitution above party loyalty or interests. It is your first duty to support, obey, and defend the Constitution of the United States and the Constitution of this Commonwealth. I appeal to your integrity as individuals and your duty as elected public servants that you remove the personal and party preferences apparently clouding your vision and place an adherence to the Constitution first and foremost in your loyalty regardless of the consequences. Adherence to the law should not depend on party convenience, partisan benefit, or job security. Instead, fidelity to the law should be the impartial guide and prominent presence self-evident in any approved redistricting plan. Excellent question! I will have to do a more detailed post on this sometime soon, but the short answer is that state redistricting does not affect the federal congressional plan. Federal redistricting uses rules that differ significantly from state rules as well as a different process for creating the maps. Congressional redistricting plans can and have been challenged. But my research on congressional redistricting never reached the point of how to make an appeal, so I do not know the specifics. Vieth v. Jubelirer was a congressional redistricting case in Pennsylvania from 2001. Perhaps looking at it would help answer some of the who and how questions. Thank you for the time and effort to demonstrate that redistricting can be done fairly and legally. Like many citizens, I am disgusted with the self serving attitude of both major political parties who put their own interests before the good of the people they are supposed to serve. If you ever run for office, you have my vote. Found your site and just have a basic question: Your premise seems to be that splitting communities and putting part in one legislative district and part in another would be harmful to that community’s representation in the legislature. But couldnt the opposite argument be made also: that if a municipality has 2 or 3 or 4 representatives in the state legislature (instead of one) that their power is actually greater? Amanda — LOVE the site and the stuff you have posted here! I’ve been using Dave’s App for awhile, and found it to be a great tool. I can’t tell you the number of times I’ve ‘tweaked’ the House and Senate maps myself. Thank you for doing all the hard work and testifying for this proposal! This is definitely better than anything the political hacks in the General Assembly could ever have put together. Amanda, I found your maps to be interesting and for the most part, well thought out. But, one thing that I think is a problem, especially in Clearfield County where I am from and other rural areas, is that I don’t believe you are taking into account existing regional alignments. For instance with Clearfield County, you have a House district in that takes in the southern part of Clearfield County but also takes in northern Cambria and a good part of Indiana county. Clearfield County is more regionally aligned in many relationships with Jefferson, Elk and Centre counties and there is little, if any, connections with Cambria and especially Indiana county. Our current legislative districts in Clearfield County have the 75th up in the NW corner of the county taking in the City of Dubois and surrounding areas and connecting with all of Elk County. Then we have the rest of the county, including the county seat of Clearfield and the very rural eastern and southern portions of the county in the 74th district. This is really the optimum design as you have DuBois and St. Marys in Elk County as the population centers for the 75th and Clearfield as the population center for the 74th. Your proposed map puts both DuBois and Clearfield in the same district and sticks the rural southern portion of the county in with northern Cambria and Indiana. I’m not sure is the city of Indiana is in this district but again, the rural southern part of Clearfield county does not regionally associate with Indiana. People in those areas come to Clearfield or flow towards Altoona for shopping and services. The one positive that did come out of the redistricting is that Clearfield County is now entirely in the 5th congressional district rather than split between the 5th and 9th districts. All that said, I do believe your ideas are more along the lines of what the founding fathers wanted – the people deciding these things – not the few in political power. I’ve been following the news articles with great interest and admiration. Today’s article in the patriot was no exception. My only problem is, you told us why the public needs to engage, but not how to engage. Thank you for bringing this to my attention. In response to this, I wrote a post on how to stay engaged (http://amandae.com/2012/04/23/stay-engaged/). Feel free to share with others. Thanks for stopping by.